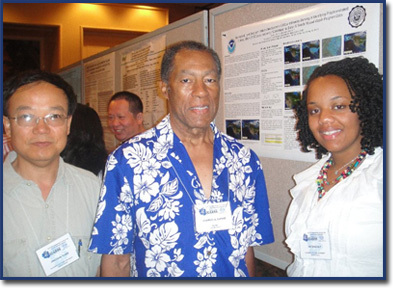 On July 25-30, 2010 Elizabeth City State University students and researchers attended the 2010 IEEE Geoscience and Remote Sensing Symposium in Honolulu, Hawaii. This 30th annual symposium celebrated accomplishments over three decades of leadership in remote sensing instrumentation, techniques, and applications development. The Symposium brought together world-class scientists, engineers and educators engaged in the fields of geoscience and remote sensing. The 2010 Symposium theme was “Remote Sensing: Global Vision for Local Action” focusing on the emerging field of Community Remote Sensing.